Hair. It’s chaotic, it’s ordered. Clean and messy, it is a sense of frustration and joy. In Sonya Clark’s solo exhibition at Contemporary Wing, AHEAD OF HAIR, Clark uses hair as a medium to represent race, class and culture. “I’ve been combing hair since I was a child,” said Clark who has been working with hair as a medium in both hairdressing and fine art for over twenty years. One of Clark’s more recent works, Pigtails, is evocative of youth. 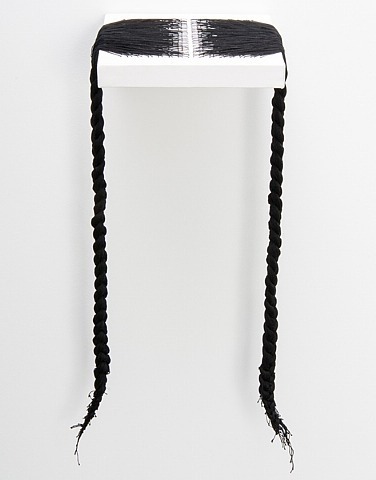 Resting on a wall-mounted shelf, a young girl’s stiff braided pigtails are woven from tactile black thread. Though the work suggests innocence, a hairstyle removed from the human head challenges the viewer to consider the means in which a young woman’s hair was taken. When hair is so deeply attached to one’s personal identity, a hairstyle without an owner begins to lose its character, lose its playfulness, becomes limp and empty. The effect is intensified looking down at the work, implicating the viewer as responsible for subjugating the hair and its human counterpart. “Hair is basically a piece of someone’s body. It’s a very intimate experience of selling a piece of someone’s body to someone else,” said Lauren Gentile, Contemporary Wing founder and director. The emotions surrounding the oldest work in the show, dating from 2003, complements with the power elicited from the suggestion of stolen youth in Pigtails. Long Hair confronts the viewer with age. A brilliant digital print of a dread is so rich with depth and texture, the viewer cannot help but yearn to reach out, to touch the hair fibers clearly pulsing with life. Astonishment and disappointment converge when the illusion is realized. 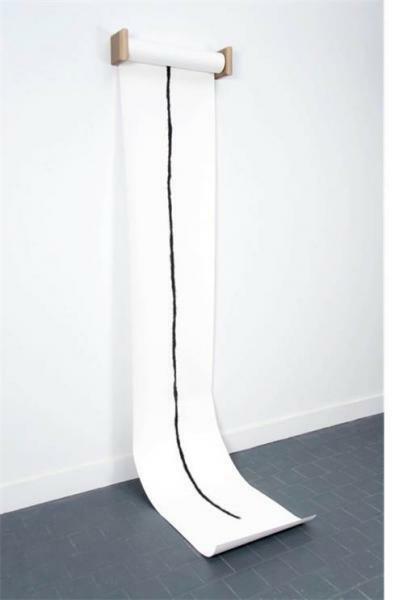 30 feet long, the work represents the length of a dread grown for 30 years. “At first, I thought it was strange to use someone’s DNA and then sell it, with the history of selling bodies in this country,” said Clark who is inspired in part, by the infinite hairstyles that became available to black women after the Africa Diaspora. 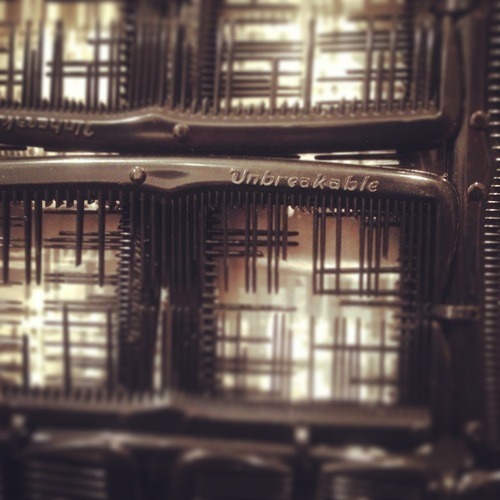 Unbreakable fashions together black fine-toothed combs branded “unbreakable” in a composition that is inherently broken, demanding the viewer to consider the societal and cultural pressures associated with issues of straight hair. Cotton to hair is at once filled with beauty—flowers touched with bronze are forever preserved behind glass—but quickly becomes bewildering when one considers the materials are cotton and African American hair. The ties to slavery are inescapable and uncanny. Though the subject matter is what compels the viewer to engage in dialogue, to contemplate his own notions of race, class and culture, it is Clark’s superb craftsmanship that makes her work truly standout. 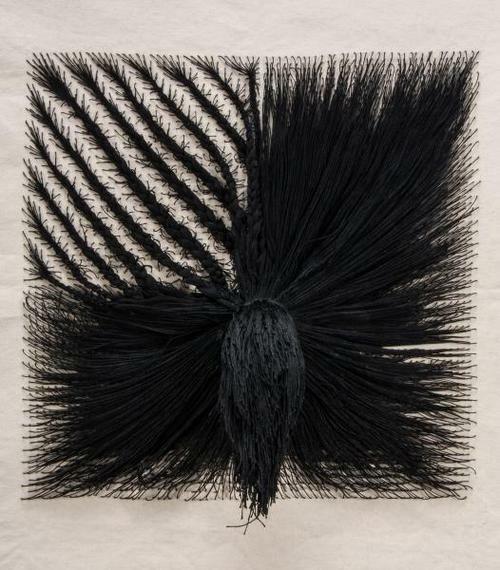 To execute Quadroon, Clark revitalized the 1990s art of stitching, by fashioning cornrows into one fourth of a canvas, and from the other three-fourths of the canvas, a heavy mass of thread, stitched together to resemble dense, but straight, hair fibers, is pulled together at the very center of the work. A ponytail extends and falls naturally into the viewer’s immediate space. Quadroon is exemplary of Clark’s extraordinary ability to deeply engage with her subject while maintaining exceptional hold on her medium and craft. A reference to race classification, Quadroon has roots in an experience traveling through Ghana, where Clark, an African-American, was called “bruni,” the Ghanaian word for a white person. Clark explained that in the context of African culture, because Clark has a white grandparent, she is considered white, whereas in the United States, Clark being three-quarters African American, is considered black. Albers Study captures this question within an art historical narrative, using Josef Alber’s canonic texts on color theory to take five colors and make them appear as six, by simply juxtaposing the colors in different ways. But Clark does not simply re-contextualize the lessons of Albers. She extends the ideology by taking two different shades of green and making them appear the same. AHEAD OF HAIR is on display at Contemporary Wing until March 2. Contemporary Wing is located at 1412 14th St. NW and open Tuesday through Saturday from 11 a.m. to 6 p.m.